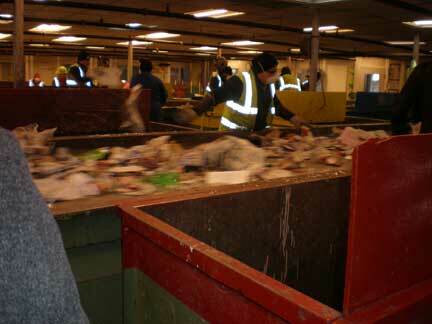 We just received photos from our West Metro Recycle America facility tour! Each year we learn about city recycling procedures, as they all vary, and we better understand the micro and macro business of recycling. This year an illuminating learning moment on the tour was discussing the need of an end market for recyclables and how that drastically changes the recycling process geographically. Example: on the coasts we recycle yogurt containers and then ship them abroad. In the central states it is not cost effective to ship this type of plastic anywhere, so they do not recycle them (and how green is it to ship it overseas, anyway?). It is important to note these differences in order for us to have an effective recycling program, proper labeling and instruction, as recycling is a key part of our greening efforts. 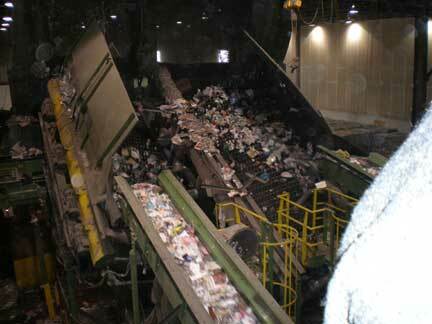 Below is the West Metro Recycle America facility we toured. The convention center also has a relationship with a pig farm for composting food waste. We toured the Pioneer Paper Stock Company for a tour of their paper/fiber processing facility as well. A very special “thank you” shout out to Shawna McKinley, our greening consultant from MeetGreen, all of our tour guides including Tom Heuer from Aspen Waste Systems, Steve Rehbein and Anita Sellers from Waste Management Recycle America, Ruth Warden from MeetMinneapolis for setting it all up and taking pictures, and everyone who does their part to reduce the enviornmental impact of our meeting (that includes you! ).